After you bite into the Tindly you will get that taste of tangy anardana and amchoor powder. Cut the tindly in between and marinate the tindly with mixture of amchoor and anardana powder for atleast 2 hours before cooking. In a non stick pan 2 tbsp of add oil. When the onions are cooked add chopped tindly. Saute the Tindly in it and cook until half cooked. Add all the spices and mix it well. Add ½ cup of water and cook with lid closed on low medium heat. Hi ! 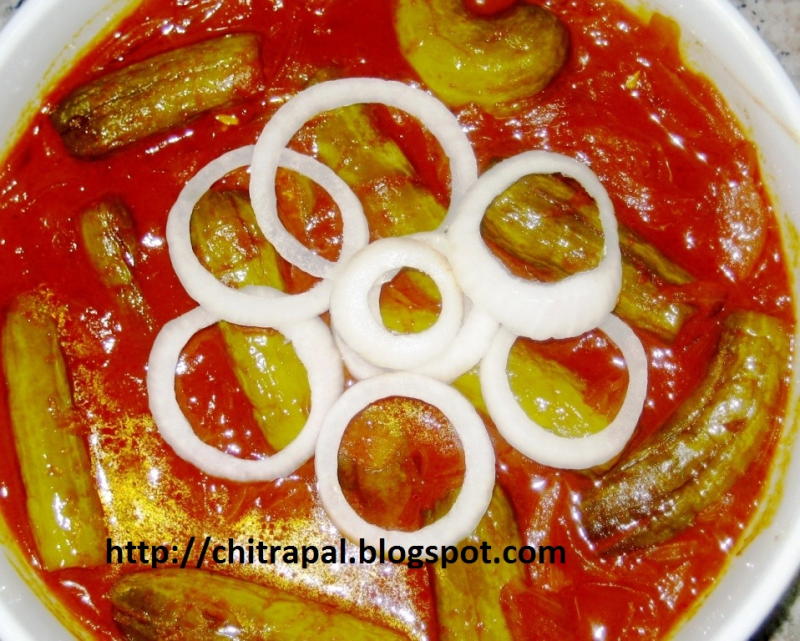 Chitra ....Lovely recipe nd Awesome pic . Thank U . Ivy gourd contains beta- Carotene , a major Vitamin A precursor from plant source . Also gud source of Protein nd Fiber .Consuming 50 gms of Ivy Gourd daily can help to keep your blood sugar under check . I always wondered how to cook this vegetable. I have seen all 3 recipes on KhanaKhazana and all are very different, will surely it now.